Roland have announced the JC-01 Bluetooth speaker, a unique addition to their Jazz Chorus line and a first as they exit musical instrument amplification and start to focus on delivering crystal clear stereo audio for your mobile phone and other devices. The JC-01 is not named for the Jazz Chorus for no reason. Although it doesn’t have a guitar input, both the appearance and the philosophy of the world-standard guitar amp series are certainly inherited. Many artists have loved the reliability and durability of the JC series since its debut many years ago. The JC-01 Bluetooth Audio Speaker enjoys the same reliability and durability that have made the JC series of products a professional standard. Connect your audio player via Bluetooth and enjoy listening to music with the real JC anytime, anywhere. The essence of the JC’s signature pure stereo sound is of course inherited as two two-inch speakers stuffed into the small body. The JC spirit embodies a high-definition and clear sound field, with a richness and transparency from mid to high range. A built-in passive radiator realizes powerful deep bass sound with this small size. Besides, the JC-01 has a three-band EQ, which is quite rare for this type of product. This allows you fine adjustment of the tone. Moreover, the JC-01 is replete with useful functions in various situations, such as an Audio In jack that enables mix playback with Bluetooth audio, and a hands-free function allowing you to talk on the phone even when your hands are otherwise occupied. 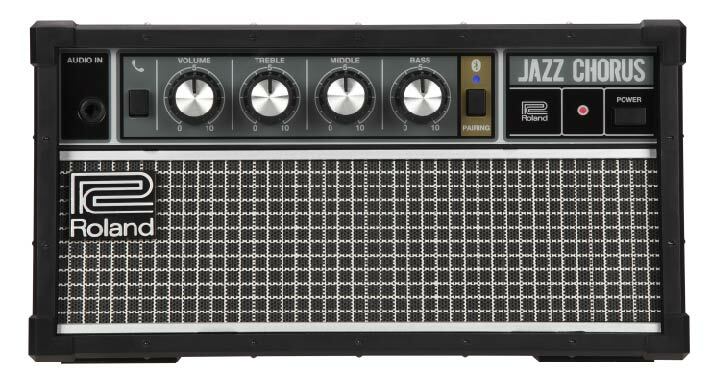 The JC Jazz Chorus is a series of guitar amps born in 1975. Since that time, its distinctive “JC Clean” tone and original “Dimensional Space Chorus” effect have been loved by many of music’s biggest names. These characteristics are achieved by a unique design, which is optimized for producing a clean sound.